Here we go! 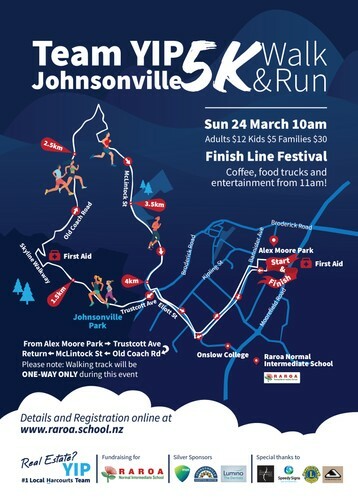 Get into the J-ville 5km loop walk from Alex Moore Park to the Northern Skyline Old Coach Rd and back, raising funds for Raroa Intermediate's giant Covered Outdoor Learning Area, a 30x18m canopy and sports floor over our courtyard area. See you there. Entries onsite at our Registration Tent. From Alex Moore to Truscott Ave, up and along Old Coach Road, down McLintock St and back! Have A Go: Have a test walk! We recommend that you grab some friends and have a warm-up walk prior to the day. Bring: a water bottle, appropriate clothing and footwear - trainers or walking boots are a must - not jandals or sandals!! The walk up the track is moderately steep and narrow in places, and may not be suitable for children under 6. It is not accessible for buggies or wheelchairs, although the route to Trustcott Ave Park is.